This wonderfully whacky work of art was published by IDW in 2016. 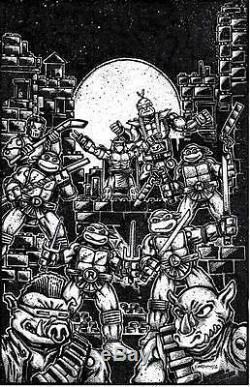 Created as the cover of the SDCC Special Edition - drawn by Kevin Eastman in the Mega Bloks style and featuring all major characters - a MAJOR COWABUNGA BONUS!!!! This original artwork measures 11" x 17". 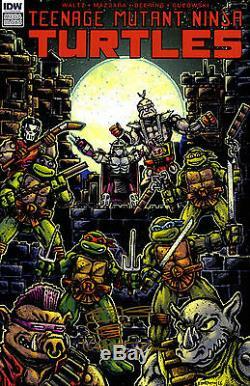 The artwork is signed by Kevin Eastman lower right - Eastman'16. 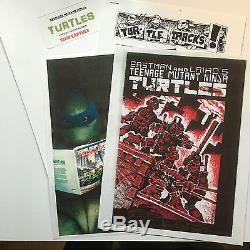 This unique package is accompanied by a hand made and signed TMNT Time Capsule , ensuring that you know the original art comes directly from the personal collection of Kevin Eastman and also 2 copies of the Mega Bloks exclusive comics both signed in gold ink on the cover by Kevin. The time capsule includes a hand signed Turtle Tracks letter of thanks from Kevin, a signed photograph and a history of highlights in the life of the TMNT. This offering represents an excellent opportunity to acquire original Teenage Mutant Ninja Turtles artwork straight from the artist. 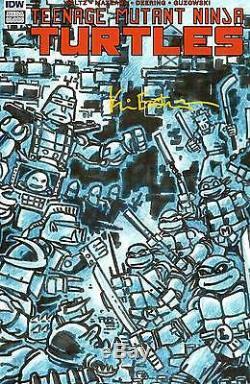 The item "TMNT /MegaBloks Kevin Eastman Original Cover Art signed with comics & provenance" is in sale since Tuesday, September 13, 2016. This item is in the category "Collectibles\Comics\Original Comic Art\Drawings, Sketches". The seller is "kevineastmanstudios" and is located in Northampton, Massachusetts. This item can be shipped worldwide.